Have you ever winced or experienced a brief twinge when having a hot drink, a taste of ice cream, or when your mouth is open and you breathe in on a cold day? 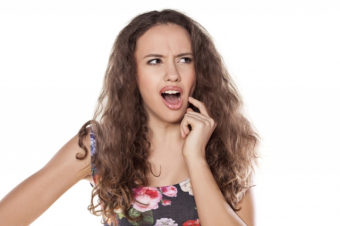 This type of tooth sensitivity is a fairly common dental condition. It is also preventable. Our Lorne Park Dental team, in Mississauga would like to teach you how. -The part of a tooth that is above the gumline, that we see when we smile, is called the crown. It is covered by hard tooth enamel. -Below the gumline, the roots of our teeth are covered by a material known as cementum. -The softer dentin is found just below the enamel, covering the crown and below the cementum, covering the roots. -Beyond the dentin is the main nerve chamber in the center of the tooth. This is known as the pulp. There are thousands of microscopic nerve channels or tiny tubules that run through the dentin of our teeth. They act as a pathway for an outer stimulus and fluid to reach the inner nerves in the pulp of a tooth. External triggers, like the ones shown above, can cause fluid movement and stimulate the nerves inside the tooth. The result is that short, sharp tooth sensitivity twinge that you may have experienced. This type of tooth sensitivity can come and go over time. Acid erosion - If tooth enamel is exposed to acidic foods or drinks, acid erosion can occur with time. When the hard outer enamel wears through, the softer inner dentin will show. Teeth grinding - If a person clenches, rubs or grinds their teeth together during the day or night, they may be wearing down their tooth enamel and causing their gums to recede. Gum recession - If the height of the gum changes, this can lead to exposure of sensitive tooth roots. Uneven tooth biting forces - If teeth are misaligned, don't mesh well, or if a filling is too high, heavier tooth biting forces may cause breakdown of tooth enamel at the necks of teeth or to be sensitive. These areas are described as a ridge or a ledge that can be felt with a fingernail. Aggressive tooth brushing - Using a long, hard brushing stroke, with the sharp ends of the toothbrush bristles, can wear away tooth structure and cause receding gums, exposed roots and dentin. Dry mouth - A lack of saliva to wash sugars and acidic foods and drinks away can result in tooth erosion which can lead to tooth sensitivity. Desensitizing toothpastes - Sensitive teeth toothpastes have ingredients that fill in nerve channels in the tooth dentin to prevent sensitivity. There are many to choose from. We can help you select the one that's right for you. Re-mineralizing toothpastes - Toothpastes that repair and rebuild natural tooth structures are now available. Be aware of clenching or grinding your teeth to avoid tooth wear and gum recession. A night guard or day guard may be recommended to cover and protect your teeth. Stress management, relaxation, limiting stimulants such as caffeine can be helpful too. Limit acidic foods and drinks such as fruit, fruit juices, carbonated drinks, sports drinks, tea, coffee and wine, to avoid tooth enamel erosion. After acidic food or drink, don't brush for half an hour. Keep up the good oral hygiene so that your gums stay healthy and don't recede. Use a soft toothbrush to avoid gum recession. Don't scrub or rush when you brush. Our dental team is happy to help you come up with a tooth brushing method that will work well for you and won't cause gum recession. Use a fluoride toothpaste at least twice a day. Sensitive teeth toothpastes should be used on an ongoing basis, for maintenance, to keep the nerve channels in the tooth dentin filled in. Sometimes, during tooth whitening or bleaching, teeth can be more sensitive. Using a toothpaste made for sensitive teeth for two weeks prior to bleaching can often minimize this sort of sensitivity. Have a regular dental check up. When we examine teeth, we are sure to point out any early signs of tooth wear or gum recession and help you develop a strategy to prevent further damage. After a dental procedure, some sensitivity for a short while may be experienced. Our dentists are always sure to tell you what to expect after dental treatment. Please remember - If you have a broken tooth or are experiencing symptoms such as pain while chewing, swollen gums or loose teeth, please see us to have it checked out. The Lorne Park Dental team is always here for you. We hope that this helps give you a better understanding of the triggers, prevention and management of tooth sensitivity. Our Lorne Park Dental team is here to help. We want everyone to have healthy, sensitivity-free smiles!